One of the best gifts for any occasion is a gift basket. One of the drawbacks though is that ready made gift baskets are often rather expensive. That’s one of the main reasons you should consider the idea of making gift baskets yourself. You’ll not only save money but you’ll also be able to utilize your creative side. The first thing to remember is to never get stuck in the idea that you have to use an actual basket. By walking around your home, you can find tons of other things; buckets, pottery bowels, plastic containers for storage, garden watering cans, the list is endless. Any type of large container could work when making gift baskets. If all else fails, wrap the gifts with cellophane and loop off with ribbon or bows. Making gift baskets doesn’t always have to be complicated! One gift idea you could use would be a music theme. If you know someone who loves music, gathering some stationary that has music notes and symbols would be a perfect idea for making gift baskets for them. You could even head out to a music store and pick up some music paper for composition. CD’s, tapes, music books, and even magnets and set outs with a musical theme would be great to buy for making gift baskets with this theme. Another cool gift idea that would be perfect to use could be a movie/popcorn theme. 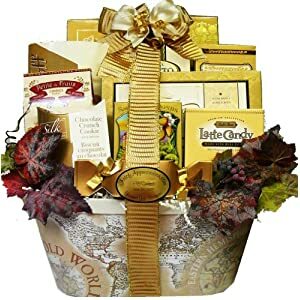 By using many different types of popcorn and a few unique flavors, you can have an interesting gift basket without having to spend loads of cash. Remember to add in a few good movies into the mix when making gift baskets that focus on entertainment. If you happened to have picked up a few chick flicks, a great add-in would be a package of tissues. When you’re making gift baskets with this theme you could easily use a big bowl for popcorn for the basket! If you’ve got someone on your gift list whose dream is to retire as a full-time angler, a fishing theme should be your focus when making gift baskets for them. All you need to do is go down to your local fishing or discount store. Hooks, rods, lures, and baits would make perfect fill-ins for your basket. If you’re out of ideas, then a magazine focused on fishing would be another neat item to include! If the person you’re making a gift for is a big coffee drinker, there are loads of things you could do to make them smile. Grabbing some coffee cups, and sticking a few chocolates inside could be an awesome way to add some fun when making gift baskets for them. If you wanted to buy a few different creamers, special coffees, and delicious cookies into the mix you have the complete package. Regardless of the idea or theme, making gift baskets can add a personal touch to any occasion.